We ended up having a great Independence Day yesterday. We were invited to an afternoon BBQ at Naomi and Brian’s place at Ela Beach Towers, and when we arrived discovered that it wasn’t a small BBQ – lots of adults, lots of kids, and a fantastic pool area with tennis court for the kids to play on. We left at about 7pm, so I could get home for a Radio Live interview back in New Zealand, and on arrival home had a message to say that they had someone else lined up for the interview, and was it OK if I was just on standby. Of course, it wasn’t really a problem, and as it was scheduled for 7:30pm – when I didn’t get a phone call I just went back to an evening with my wife, and a very exhausted early night. At 10:25pm, I woke up to my phone (which was on silent) flashing an incoming phone call. Yes – I know it’s weird that a silent phone can wake me up, but such is life when you are always oncall – I can tune out kids crying in the night, wake up to kids vomitting, sleep through kids climbing in the bed, and wake up to a little light flashing on the phone. So I answered the phone, and it was bloody Radio Live. I was doing a WTF moment and wondering what the hell they we’re doing ringing. The guy at the other end of the phone said 10:30pm PNG time….! D’oh. Turns out the number 1 had fallen through, and I was it. So I had a nice chat to some guy Hamish, at 1:30am NZ time to an audience of maybe 1 or 2 (who else is listening to talkback at 1:30am Monday morning). I love pushing a positive image about PNG, as the media really beats the country up… I bet most of the writers have never been here though… So talked for maybe 10 minutes, before saying goodbye- and then when the phone clicked off, realized I hadn’t even put a plug in for my blog! Must have been too tired! 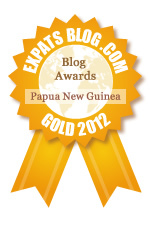 Today is the observed Independence Day holiday here in Papua New Guinea. And l think the whole whanau agrees – we are all too buggered to do anything! We then caught up with our US mate Matt and his son Ty outside the Bisini Softball grounds hoping to see one of my team dancing in an East New Britain sing sing. However the line was HUGE, the temp was hitting 34 and there were some boys getting a bit niggly in the queue, so we decided to head down to Ela Beach. Unfortunately, the events at Ela Beach finished just as we arrived, so we headed out onto the beach for the kids to find starfish and play with some local kids. Also instantaneously, a game of touch footy started up, and of course – I was there with my ever present Sony NEX-5N camera to try and get some nice shots. We had an awesome day, topped off with Derrick coming home for a few beers, then I took him back to see his father in hospital in time for 5pm visiting hours. Sadly, at 8pm Derrick rung me with the news his father had passed away. So whilst you are reading this, and looking through the photo’s – I dedicate this series of photos to a visionary leader, from the mighty Sepik river who has raised a fantastic young man (as well as his other family). Please spare a thought for those that have lost loved ones over the course of this 37th Independence Celebrations.